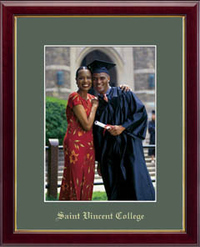 Showcase your graduation, group, or team photo with our coordinating embossed photo frame. It is beautifully gift-boxed and features your school name gold embossed on Williamsburg green museum-quality matting. It is framed in Galleria moulding, a solid hardwood with a high-gloss cherry lacquer finish and an inner gold lip.